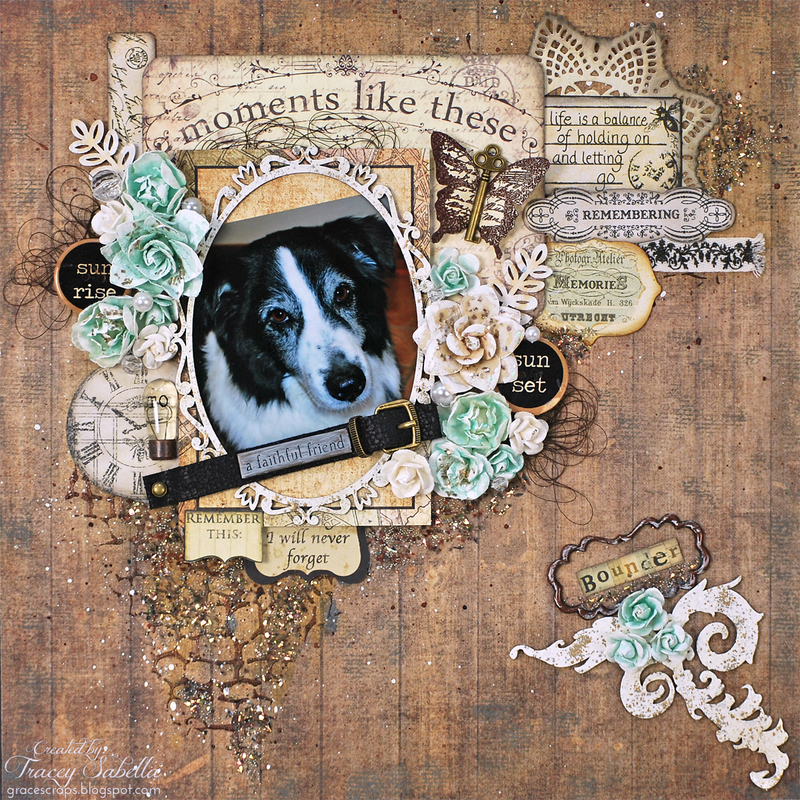 Although it is sad to lose a family pet, we have many happy memories of our Australian Shepherd, Bounder. He was 13 1/2 years old and our daughter, Elizabeth's, dog. She had many fun times with him at 4-H and UKC obedience shows. They were one of the top ranked junior obedience teams for several years. When Elizabeth moved out, Bounder remained with us and he was quite a buddy to us, especially for my husband who took him on walks every day. Bounder loved to accompany us on any outdoor work we did around the house. I've created a layout to remember our buddy featuring the Leaky Shed Studio Harja Flourish Zwei and Victorian Oval Frame. The Leaky Shed Studio Harja Flourish Zwei fit perfectly to accent Bounder's name and my page title. I flipped the chipboard over for this orientation and since I planned to heat emboss, I was okay with not having the engraved design. 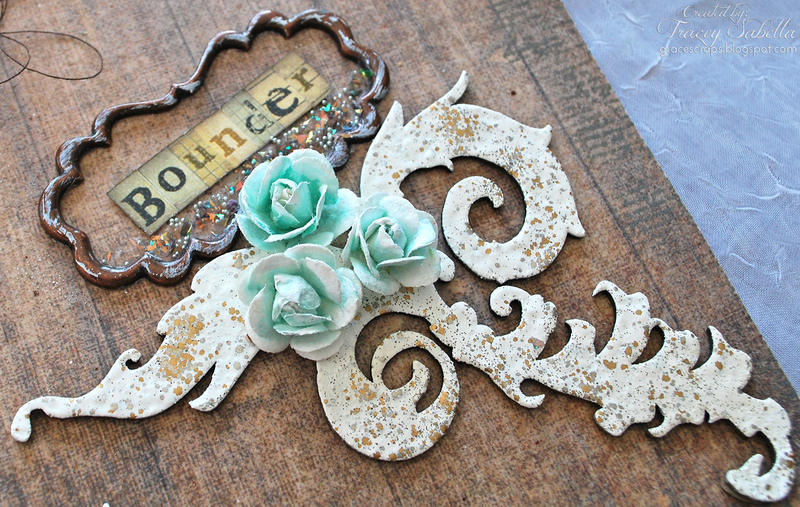 To color, I covered and heat embossed with Jasmine Mix'd Media Inx Embossing powder. 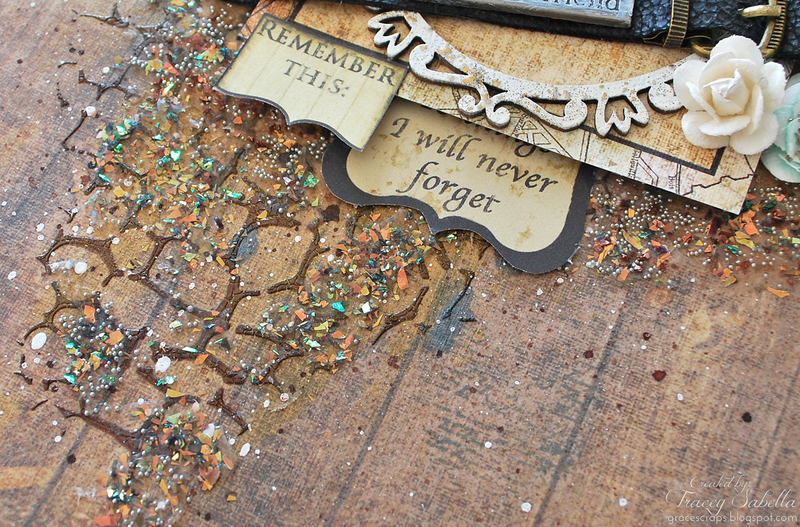 I then reheated areas and sprinkled lightly with Aged Taupe Fran-tage embossing enamel and continued to heat until it melted and repeated until the entire piece had sprinklings of the taupe color. Here you can see a snippet of the Leaky Shed Studio Victorian Oval Frame, I used the same technique to color as I did for the flourish. 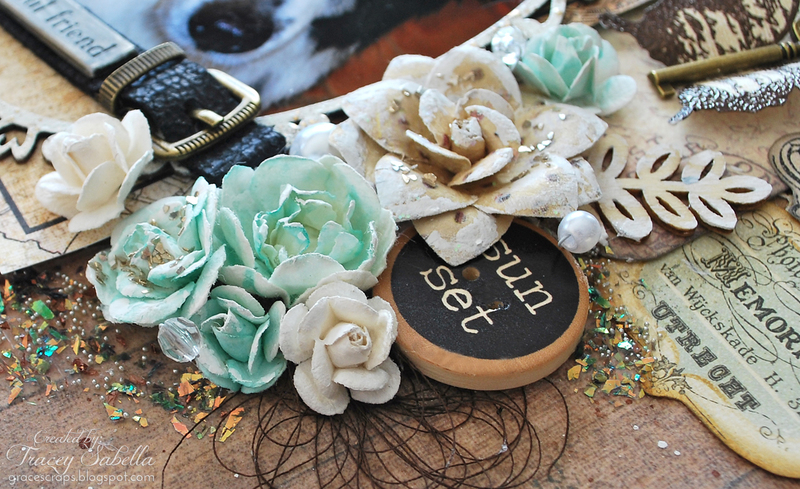 I've embellished with mist dyed flowers sprinkled with chunky glass glitter. 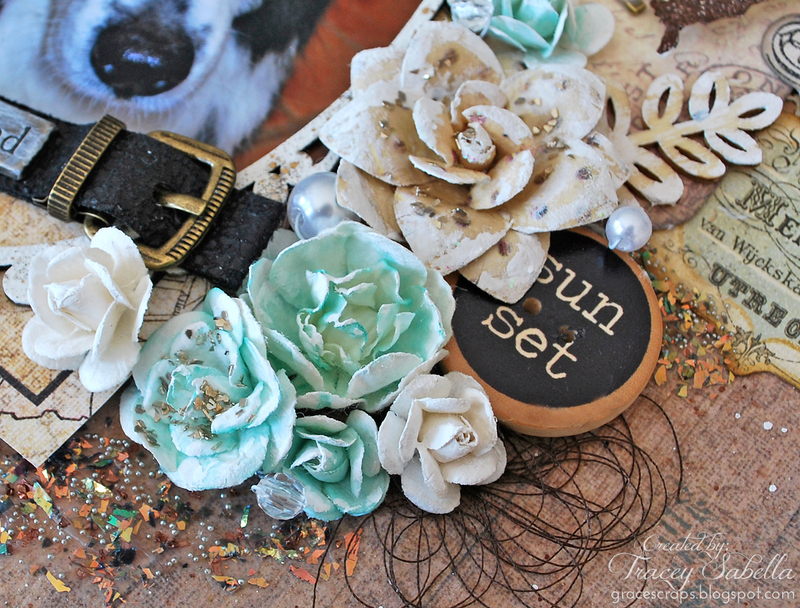 I created a "dog collar" with a Tim Holtz Buckle and leather textured fabric. Loops of thread are added in for texture. I wired pearl and crystal beads to tuck into the flower clusters. 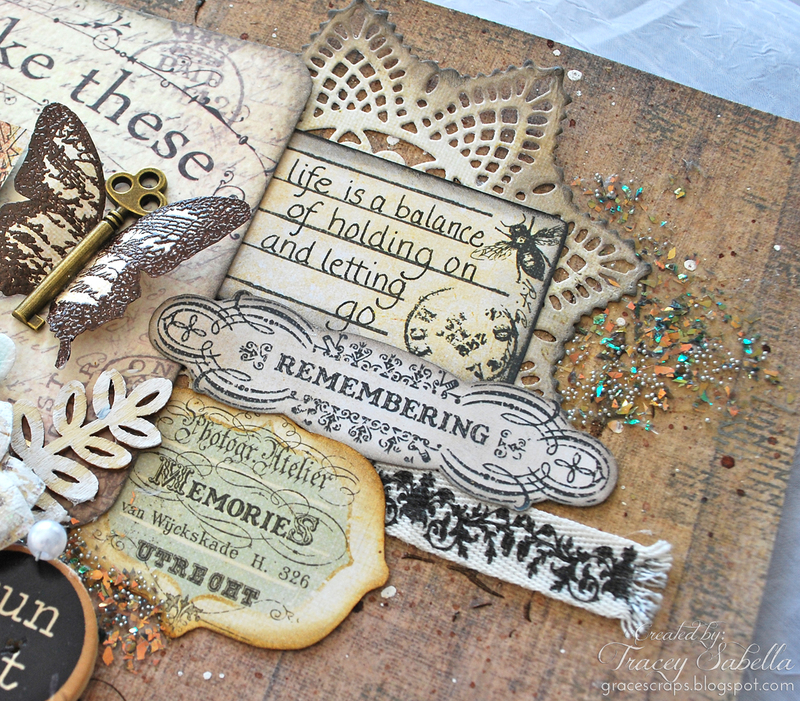 I did a bit of fussy cutting from Prima paper to get these lovely and appropriate sentiments. 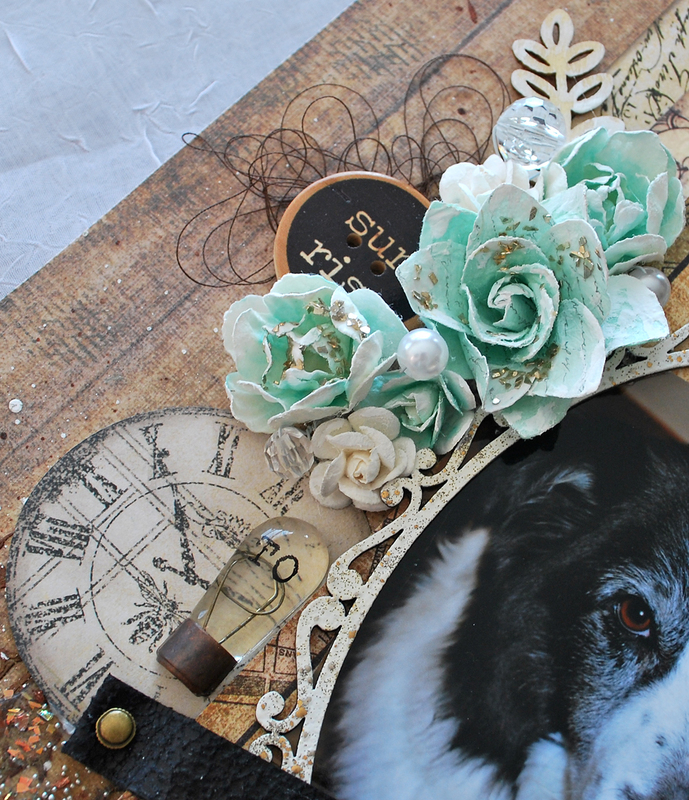 More of the Leaky Shed Studio Victorian Oval Frame and Prima sentiments. You know I love texture!! Here I've used a Prima Stencil with crackle medium as a base, then spritzed and splattered with Color Bloom mist and more splatter with drawing ink. Then I topped it all with microbeads, glass glitter, and mica flakes. 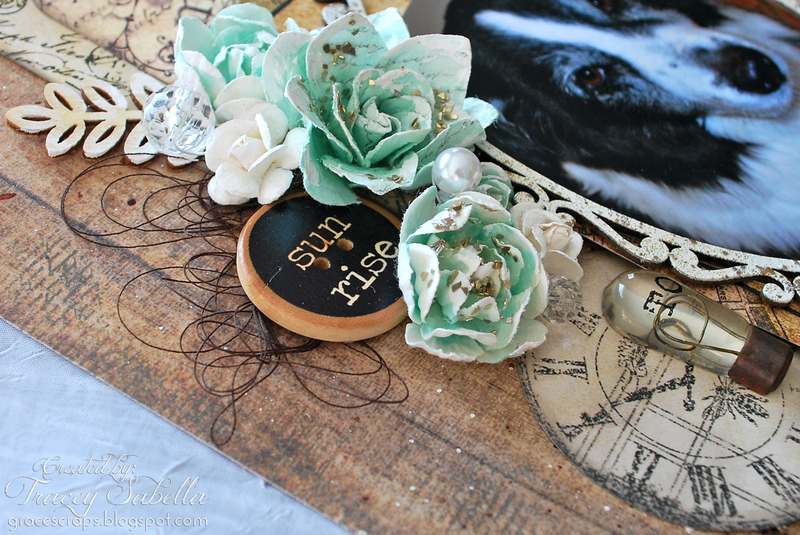 For more details on how I drew inspiration from the January Prima Build-A-Page and Scrap Around The World Mood Board, please stop by my blog, Garden of Grace, HERE. So glad you stopped by today!! LOVE your layers and clusters!! BEautiful!! Baby Canvas with Tracey G.
Floral Birthday Card by Tracey S.
Altered Faith Journal with Tracey G.